Because of the nature of our preschool workshops 20 is the maximum number of students in a single workshop. Below is a list of all of the preschool programs that we offer. Each program runs approximately 30 to 45 minutes. Programs are for children ages 3-5 years. 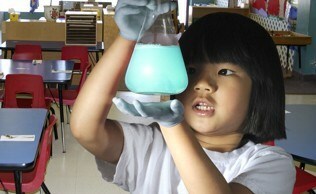 Learn and explore the world of Mad Mixtures with simple chemistry fun! Discover crazy colors and watch a volcano bubble. Children even get to make their own modeling dough to take home! Students will explore the world's most abundant animal. Insect defenses and their role in our ecosystems will be explored in fun, hands-on activities that introduce children to these fascinating creatures! Children will use their knowledge of insects to make their very own bug model to take home. Witness a mini rocket launch while learning the properties of heat. Change the states of matter, turn solid candy into floss and make your very own cotton candy that you can eat. In this thrilling workshop preschoolers pretend they’re in the wild and learn about animal sounds and explore camouflage! Children will explore the science of the sea when they learn about what sand in made from, how shells are used by animals for protection and what animals live in the ocean. 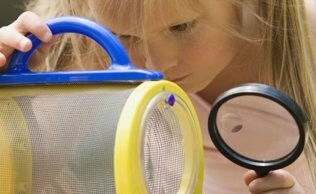 Children will be excited to learn all about their fine feathered friends when they take a close look at birds. They will discover how to match bird mates, see what eggs are produced by which species; learn how a bird’s beak is a tool and how to identify different bird’s songs. Preschoolers will take home bird warblers to practice their bird songs at home. This workshop will introduce students to the science behind the sounds all around them. Children will experiment with a wave motion model and a twirling tube to help them understand that sounds travels.